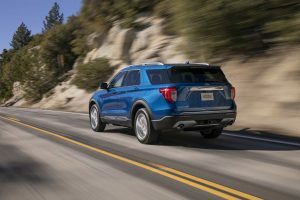 Home » Ford Explorer » What New Drive Modes are Featured with the 2020 Ford Explorer Lineup’s All-New Terrain Management System? There are a lot of all-new features and capabilities to love when it comes to the all-new 2020 Ford Explorer. That’s why we’ve been taking the time here on our Brandon Ford Blog to take an in-depth look at some of the best all-new features and all-new capabilities for the 2020 Explorer lineup. This time around, we’re going to be taking an in-depth look at the 2020 Explorer lineup’s all-new Terrain Management System and the seven new drive modes that it offers. So, sit back and relax as we explain the new Terrain Management System of the all-new 2020 Ford Explorer lineup. What is the All-New Terrain Management System Featured in the All-New 2020 Ford Explorer Lineup at Brandon Ford in Tampa FL? What New Drive Modes Can You Choose from in Your New 2020 Ford Explorer from Brandon Ford in Tampa FL? As we mentioned, there are seven new drive modes to choose from in your 2020 Ford Explorer. They are: normal, trail, deep snow and sand, slippery, sport, tow/haul, and eco. For more on the 2020 Ford Explorer lineup or for more on the other new Ford cars, trucks and SUVs available at Brandon Ford in Tampa, FL, please contact our staff. This entry was posted on Wednesday, January 23rd, 2019 at 8:00 am	and is filed under Ford Explorer, Powertrain. You can follow any responses to this entry through the RSS 2.0 feed. Both comments and pings are currently closed.